There is not just one-way to defend yourself, it’s depending on all factors around you and yourself. It’s good to be able to do a lot of advanced stuff, but in the moment when you need to use techniques to take care of yourself, it’s important to keep it simple. The simple stuff is always working, and it’s taking care of business fast. It doesn’t matter which system you are training, but the only meaning is to handle the situation fast. You can do all sorts of techniques, but remember to think about the attacker as a target with many weak zones. The zones can be different depending on how the attacker is built, and how he is moving and so on. There is no right or wrong distance when you are attacked. However, you should use different defending techniques depending on range. But all the techniques that you are using should not get yourself in a risk zone, because when it’s real then it real. If we are looking at kicks, I recommend low kicks that give a good range. Kicks from Whing Chun and Thai boxing is a good start. Whing Chun have many stop kicks and kicks that is ment to destroy the attacker. Thai boxing have powerful round kicks that can be used on the total foot. On a little closer range, the knee is perfect especially if you get hold of any part of the opponent. If you are closer I would prefer to use a combination of hits with arm and elbow, and you should always think about points that will give a lot of pain. Remember that it’s always painful to hit hard parts like the skull. In self-defense I seldom use the knuckles, and I mostly hit parts that will set the opponent out. If I hit a weak part, my hit doesn’t have to be hard at all. 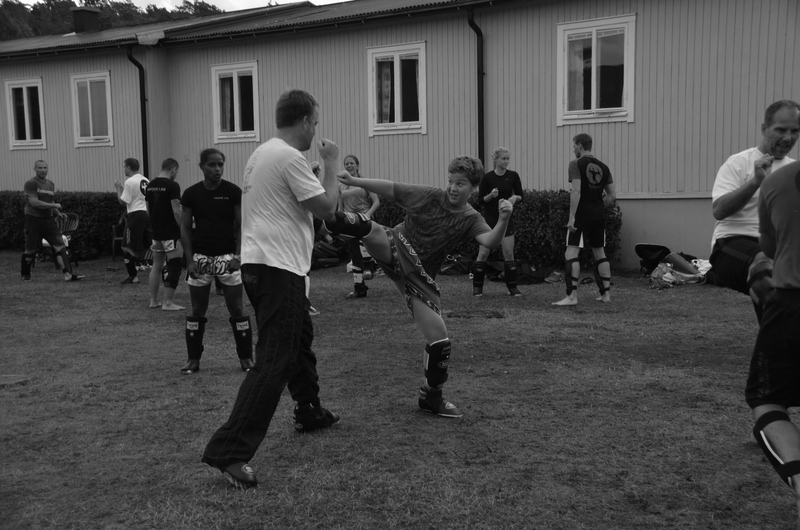 However, remember that self-defense is not just kick and jabs, it’s a combination of all kind of techniques you need to use to get out of the bad situation. So if you look at different ranges and try to learn some techniques on all range then you are on a good track. This is just a little about what you can do, but as more that you understand as more you will be able to combine. Remember if you are in range for using your techniques then the opponent is also normally close to your range. If you are being hit or kicked, normally it’s best to do a counter at the same time. If you can’t manage that, then you have to reduce the hit. The best is to get away and if you can manage to change the direction of the attack, you will be much safer.